Tags:2019, Dorothy Butler Gilliam, Freedoms Call, Journalism, Media, Richard Beyer, Robert D. Short Jr.
She has been at Ebony for less than a year, but Kierna Mayo is already on a Tina Brown-type trajectory to change the publication, and scramble what we think of as the journalistic status quo. Mayo encouraged students to bring their “authentic self” to their work and to critically examine the culture in which they cover. Mayos has deep roots in magazines, including stints at Honey and Cosmo Girl and even the Source. She also talked about the day she played hookie from work to cover and experience the street procession following the funeral of The Notorious B.I.G. She is credited with giving Mary J. Blige the “Queen of Hip Hop Soul” label back in the day. She visited SU’s Newhouse School as part of the Leaders in Communications series. Mayo is the second Hampton University graduate we’ve seen speak to the journalism students. 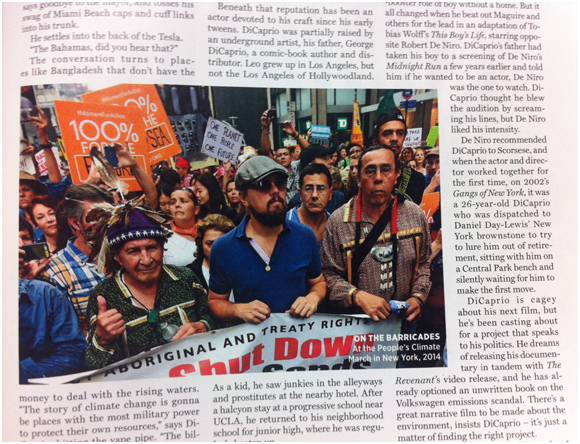 In case you decide to check out the Rolling Stone piece by Sean Penn, which will be remembered more for the post controversy than the actual writing, make sure to flip a few pages to the right to see the Dicaprio profile, which includes the photograph above. 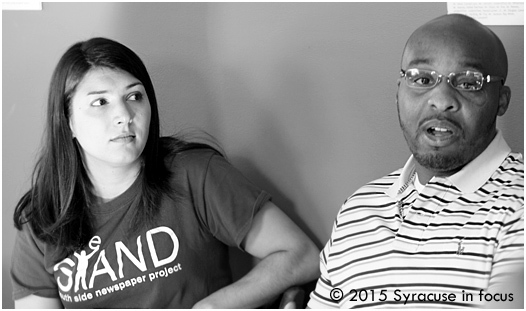 Journalist and author Byron Pitts gave some advice during a visit to Syracuse University. Pitts (along with Soledad O’Brien) will be part of “Conversation on Race in America” concert special that airs tonight on A&E Network and AOL.com. 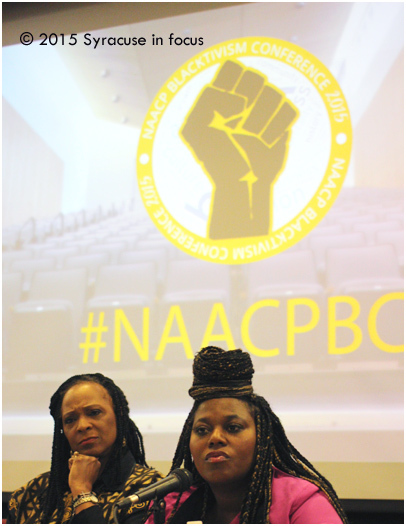 Angela Robinson (left) and Tionna Smalls told students to pursue excellence and understand their power in this contemporary media climate yesterday. They agreed that to change the images of minorities in the media, ownership and being objective with a pinch of positivity are key. 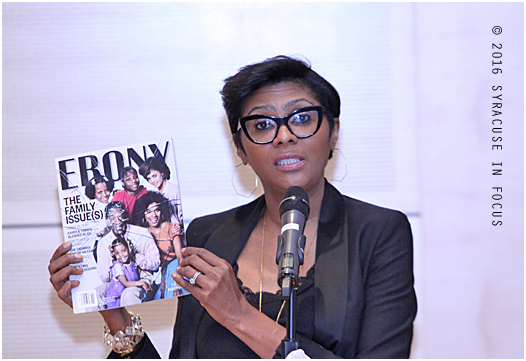 Robinson is host of “In Contact,” a public affairs show in Atlanta. She is also a graduate of Syracuse University. Smalls is an author, blogger, relationship expert and host of the MTV series “Girl, Get Your Mind Right.” Their discussion, which was part of the Blactivism Conference, was moderated by Lorraine Branham, Dean of The Newhouse School of Public Communication. 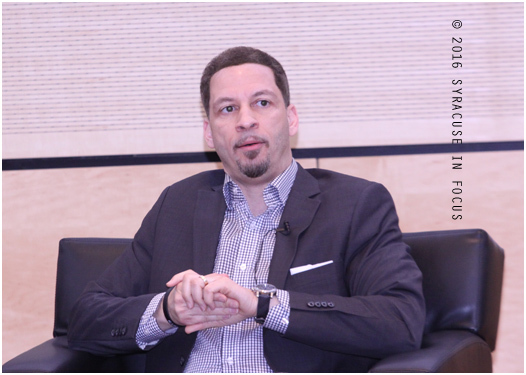 2015 Blacktivism Conference (Panel Discussion). 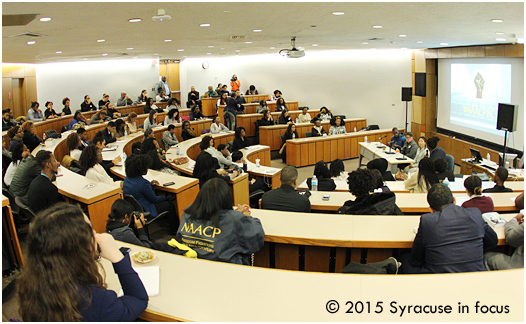 Today’s Blacktivism Conference, organized by Syracuse University NAACP chapter featured activists such as Bobby Seale, DeRay McKesson and Martese Johnson, as well as journalists Angela Robinson and Tionna Smalls. 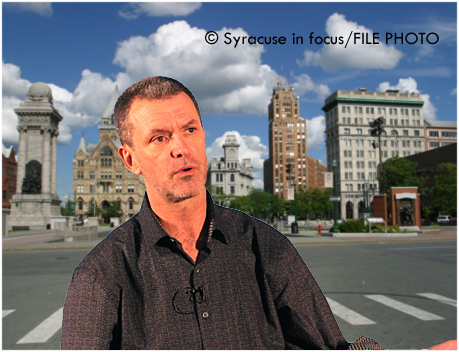 Philly had Steve Lopez; Detroit had Mitch Albom; New York had Jimmy Breslin; and here in Syracuse, for nearly 30 years, we had Sean Kirst. He has been the kind of local journalist who, if we could somehow take soul out of his body, and convert it to an mp3 audio file, what you would hear, if you listened close, is the heartbeat of this city. Today is Kirst’s last day at The Post Standard, and he will be truly missed. We are not sure of the salary for a mid-sized city columnist these days, but when it comes to stepping up to the plate to represent the common man (or woman), and making a difference using the written word, Kirst is one of our best story-tellers, and he exits as one of the richest men in town. 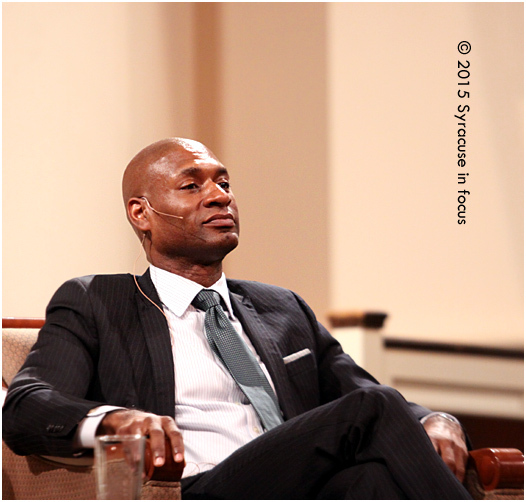 This week NYT columnist Charles Blow appeared at the University Lecture Series and also as a guest at the 50th Anniversary of the Thursday Morning Roundtable Breakfast. Journalist Ashley Kang (left) listens to Quante Wright during today’s Talk Back session at the South Side Communications Center. Below listen to a brief comment made by Wright about re-entry into the workforce following incarceration. He was the subject of a cover story in this month’s Stand Newspaper. Wright was joined on this mornings panel by author General Davis.